Background Football has a higher injury rate compared with other team sports such as rugby, in terms of two main categories: intrinsic (individual) and extrinsic (environmental) factors. The playing field is an extrinsic risk factor which has been poorly investigated in the literature. Purpose The aim of our study was to define the incidence and risk factors of injuries in a cohort of footballers comparing the role of three different types of playing field (hard court, natural grass or synthetic grass). Study design This was a cross sectional prevalence study. Methods The population comprised footballers recruited by a convenience sample; the instrument used for the survey was an anonymous self-administered questionnaire. Results 267 football players were enrolled (average age 23.4±4.8 years), of whom 33.7% (n=90/267) played on hard court, 33.0% (n=88/267) on natural grass and 33.3% (n=89/267) on synthetic grass. The overall incidence of injury was 40.1 (95% CI 34.1 to 46.8) ×1000 person-years of training, with higher values for ankle and knee injuries. Ankle injuries (aOR 0.4; P=0.021) were associated with playing on natural grass as a protective factor, while playing on natural grass seemed to be a risk factor for muscular injuries (aOR 2.3; P=0.026). Conclusion Our study showed a high lifetime prevalence of injury among footballers (57%), in particular among athletes who play and train on a hard court. We have studied a topic poorly investigated previously and provide the opportunity to understand interventions to increase the capacity of stakeholders in preventing injuries. The aim of our study was to define the incidence and risk factors of injuries in a cohort of amateur footballers playing in Puglia (south of Italy, around 4 000 000 inhabitants and 47 767 football players associated with the regional official football federation34) and evaluate the risks of playing on three different types of playing field (hard court, natural grass or synthetic grass). This was a cross sectional prevalence study. The study population comprised 267 male footballers recruited by a convenience sample in 12 official football clubs (affiliated to the Italian Football Federation (FIGC)) in the Puglia region. The survey was authorised by the chiefs of the enrolled clubs. The recruited clubs participated in the championships of excellence, promotion, first and second categories (regional and inter-regional championships of FIGC). Athletes were interviewed during the training sessions at the start of the annual activities (August/September 2017). The official Italian schedule for these teams involved 25/30 matches every year (around 1 per week) from October to May. The typology of the playing field (hard court, natural grass or synthetic grass) was attributed to each questionnaire regarding the club (the information was reported by the chief of the club at the start of the survey). Compiled questionnaires were inputted into a database created by Google Drive software and data analysis was performed by Microsoft Office Excel and STATA SE14 software. Continuous variables are described as mean±SD and range, and categorical variables as proportions. To calculate the person-years incidence rate, years of practising football was used to calculate the denominator; 95% CI were calculated for incidence rates. multivariate logistic analysis, association with type of playing field (hard court, natural grass or synthetic grass), age, years of football practice, years of militancy in current team and years of play in current category, were evaluated. The adjusted OR (aOR) values were calculated, with 95% CI, and the test z score. For all tests, significance was set at P<0.05. A total of 267 football players were enrolled, of whom 33.7% (n=90/267) played on hard court, 33.0% (n=88/267) on natural grass and 33.3% (n=89/267) on synthetic grass. 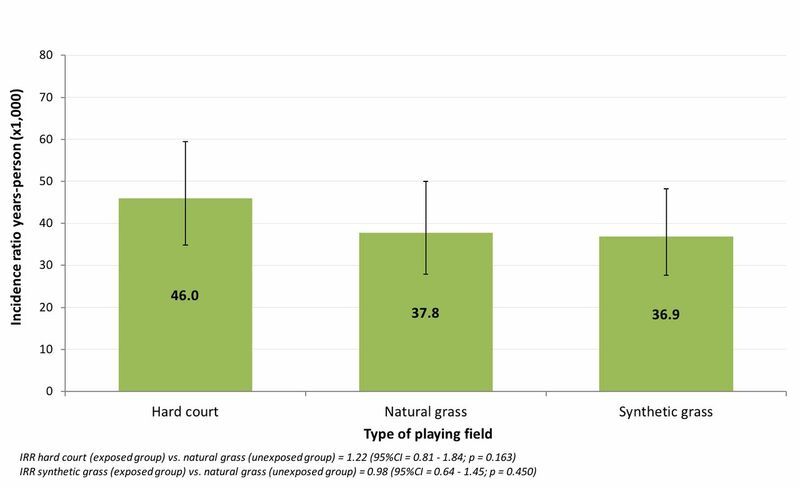 Mean age of the enrolled sample was 23.4±4.8 years (range 17.0–45.0 years) without no statistically significant differences between types of playing field (hard court, 23.2±4.6 years; natural grass, 23.2±4.6 years; synthetic grass, 23.8±5.4; k=0.4; P=0.809). The enrolled subjects had played football for 14.3±5.0 years (range 2.0–30.0 years). Time in the current team was 2.2±2.1 years (range 1.0–13.0 years) and in the current category 2.3±2.1 years (range 1.0–12.0 years). One-way ANOVA analysis showed a statistically significant difference in average time of football practice by type of playing field (F=4.4; P=0.014). In particular, the Bonferroni correction showed that the length of time of football practice was less among those who played on hard compared with those who played on synthetic grass (t=0.3; P=0.011). There were no statistically significant differences in the average time of playing in the current team by type of playing field (k=2.3, P=0.309), while there was a statistically significant difference in the average time of playing in the current category, with the synthetic grass group showing a smaller value (k=6.5, P=0.039) (table 1). A total of 153 of 267 respondents (57.3%) reported at least one injury due to the football activity, and the overall incidence rate of injury was 40.1 (95% CI 34.1 to 46.8) × 1000 person-years of training (figure 1). Incidence of injury ×1000 person-years of training, by type of playing field. IRR, incidence rate ratio. The IRR among those who played on hard court (exposed group) and those who played on natural grass (unexposed group) was 1.22 (95% CI 0.81 to 1.84, P=0.163), and IRR among those who played on synthetic grass (exposed group) and those who played on natural grass (unexposed group) was 0.98 (95% CI 0.64 to 1.45; P=0.450). A total of 73 of 267 footballers interviewed (27.3%) reported at least 1 knee injury due to football activity, 11/267 (4.1%) reported at least 1 hip injury, 59/267 (22.1%) reported at least 1 ankle injury, 6/267 (2.3%) reported at least 1 spinal injury, 39/267 (14.6%) reported at least 1 muscular injury and 27/267 (10.1%) reported at least 1 accident of another nature; table 2 describes the incidence of injuries × 1000 person-years of training, for a single injury site (knee, hip, ankle, spine, muscle injury or injury of other nature) and typology of the playing ground. Table 3 describes the IRR for athletes who played on hard court (exposed group) and those who played on synthetic grass (exposed group), per type of injury. Table 4 describes the mean number of injuries per injury site. For muscular injuries, the average number was different for different playing fields (F=4.0; P=0.026), and Bonferroni correction showed a statistically significant difference between hard court and synthetic grass (t=0.6; P=0.032). Multivariate logistic regression analysis showed a statistically significant association between occurrence of injuries and years of football practice (aOR 1.1; 95% CI 1.1 to 1.2; z=2.0; P=0.045) and years of playing in the current category (aOR 1.2; 95% CI 1.0 to 1.4; z=2.2; P=0.027). Ankle injuries (yes/no) were associated with playing on natural grass (aOR 0.4; 95% CI 0.2–0.9; z=2.3; P=0.021) and time of playing in the current category (aOR 1.2; 95% CI 1.1 to 1.4; z=2.2; P=0.031). Finally, muscular injuries (yes/no) were associated with playing on natural grass (aOR 2.3; 95% CI 1.1 to 4.9; z=2.2; P=0.026), time of football practice (limits of statistical significance: aOR 1.1; 95% CI=0.9 to 1.2; z=1.9; P=0.054) and years of play in the current category (limits of statistical significance: aOR 1.2; 95% CI 0.9 to 1.4; z=1.9; P=0.055). Our study showed a high rate of life time injuries among football athletes (57%); the incidence of injuries was 40×1000 person-years of training with a higher value among footballers who trained and played on hard court (47×1000) compared with thosed who trained and played on natural or synthetic grass (38×1000 and 37×1000, respectively). The knee was the anatomical area with the highest prevalence of injury (27%), followed by the ankle (22%). The high frequency of injuries to the lower limb is consistent with the motor skills of this sport35: high speed running, sprint running, dribbling and kicking the ball. Muscle injury were also very common (15%); despite not having differentiated the anatomical sites, in the literature they are reported as thigh muscle strains, with the most common being the adductors, hamstrings and quadriceps.36 The prevalence of muscle injury seemed to be lower in our sample than in elite players: a Brazilian study in 201837 analysed the injuries of elite players in two main divisions (A1 and A2) of the São Paulo Football Championship, estimating that overall, muscle injuries reached 36–43% of all accidents. A 2016 study38 focused on injuries in footballers during the 2015 America Cup, concluding that muscle and tendon injuries were the most frequent. This difference could be due to the different composition of the sample (elite groups in the cited studies, regional/inter-regional categories in our study). It is probably related to the differences in the training programmes; among elite players, the intensity of the workouts is higher and the number of weekly games is greater. Our data are consistent with the literature that reported the frequency of quadricep and hamstring strains, anterior cruciate ligament ruptures and ankle syndesmosis injuries in soccer.3 Collision with another player, and tackling and running without contact are the common mechanisms of injury. Some authors25 39 reported that about half of the traumas are caused by contact, and the other half involved no body contact. Even the characteristics of the type of playing ground can be responsible for the onset of sports injuries. Numerous injuries have been attributed to playing on hard court or artificial turf.40 More recently, newer generations of artificial turf have been developed to duplicate the playing characteristics of natural grass. Potential mechanisms for differing injury patterns on more rigid surfaces (hard court, synthetic grass) compared with the softer ones (natural grass) include increased peak torque and rotational stiffness properties of shoe–surface interfaces, decreased impact attenuation properties of surfaces, differing foot loading patterns and detrimental physiological responses. The IRRs among subjects who played on hard court and synthetic grass (exposed group) and those who played on natural grass (unexposed group) were >1 (P>0.05), and hence athletes who play on these types of playing field seem to be more at risk of injuries compared with those who play on natural grass. For all analysed areas, the incidence rate of injury was higher in footballers playing on hard court, except for muscular injuries, for which we found a higher incidence rate in subjects who played on natural grass. Playing on hard court seemed to be a risk factor for ankle injuries (IRR 2.1; P=0.04), while playing on natural grass seemed to be a risk factor for muscular injuries (IRR 0.4: P=0.016); this last evidence was confirmed in the regression model in which muscular injuries seemed to be associated with playing on natural grass (aOR 2.3; P=0.026) although we found a greater average number of individual muscle injuries in subjects who played on hard court that in those who played on natural grass (P=0.032). Furthermore, playing on natural grass seemed to be a protective factor for ankle injuries (aOR 0.4; P=0.021) and, overall, injuries seemed to be associated with a greater number of years of practice. As already specified, we found very few papers in the scientific literature on this issue. A 2011 review41 showed similar incidence rates of injuries in footballers who play on artificial turf and those who play on natural grass; in particular, there was an increased risk of ankle injury playing on artificial turf (IRR 0.7–5.2) and beneficial inference of an artificial surface on muscle injuries. Both studies are consistent with our results. A 2017 Japanese study42 investigated 400 soccer players surveyed for 12 year after conversion of the field from soil to artificial turf, showing that there was a significant increase in the incidence of upper extremity trauma and a significant decline in the incidence of lower extremity muscle strain; this is consistent with our observation. To our knowledge, there are no studies showing the impact of hard court on the epidemiology of injuries in football players. The strength of our study is the balanced sample, the investigation time (14 years) and having dealt with a topic that has been poorly studied in the literature. In particular, previous studies focused only on elite footballers that often play and train on natural grass; the choice of investigating athletes from regional and inter-regional categories allowed analysis of the role of the playing surface. The major limitation of the study is that we did not investigate the characteristics of the injuries (ie, severity, type of trauma (acute/chronic), recovery time, period (training/season match), number of training/match per week, phase of the season, etc). Also, the design of the study did not involve the use of medical records, and the accuracy of self-reported diagnosis is a concern. In addition, we did not investigate the individual characteristics of the soccer players (anthropometric data, previous injuries, nutritional programme) and if the athlete was subjected to specific training for the prevention of injuries. Furthermore, we did not evaluate the incidence of injuries for specific role of play (goalkeeper, defender, midfielder, etc) or if the injury occurred on the home field or on the field of the away team (that could be different than the training/home field). Finally, we did not evaluate the cost associated with injuries and the status of the court (new or recently restructured vs old court). In the future the study should be repeated recruiting more football players and investigating the critical issues described above. The most important recipients of our results are the sports federations that have responsibility for deciding rules about sports fields. These rules must be periodically reviewed based on the results of scientific studies on the effects of playing fields on sport performance and the safety of athletes. If the results of our study are confirmed in other surveys, the football federation have to consider revising the rule for accreditation of the court, avoiding the use of hard courts for clubs who train several days a week, for example. Also, clubs must pay attention to this topic, in particular because often the same playing field is used for sport initiation courses, and the theme of prevention of injuries is crucial for athletes and cadets. We believe that our study can influence the practical choices of clubs regarding a reduction in injury risk; knowledge of the characteristics of the playing field can direct clubs towards rational management of their athletes in order to optimise their performance for the achievement of seasonal sports objectives. We acknowledge Professor Salvatore Barbuti for training the authors of this study in the field of epidemiology and football culture.
. Endurance and strength training for soccer players: physiological considerations. Sports Med 2004;34:165–80.
. Severe injuries in football players. Influencing factors. Am J Sports Med 2000;28(5 Suppl):S58–68.
. Epidemiology of soccer players traumatic injuries during the 2015 America Cup. Muscles Ligaments Tendons J 2016;19;6:124–30. Contributors Bianchi FP and Veneziani V designed the study, collected results, analysed data and draft the manuscript. Cantalice MA contributed to the collection and analysis of data. Tafuri S e Notarnicola A tested the questionnaire and revised the protocol of the study and the manuscript. Ethics approval The study was approved by Osservatorio Epidemiologico Regionale.